Most people agree that the UK needs more engineers. In fact, we’ve needed them for a while now. Sometime in the first decade of this century, no one is quite sure when, the acronym Stem was coined as a way of solving this problem. What we needed, the argument went, was a focus on four subject disciplines – science, technology, engineering and maths – at school and university, and we would be able to grow more engineers. Wrong. As the world-class civil engineering department at UCL has shown, undergraduates do not need to have maths or science at A level to be able to excel in engineering; it’s the mindset of students that matters more. Wrong. As the proponents of Steam have shown, other subjects are important, too. Art and design and the arts, more generally – the "A" in Steam – have much to contribute; design thinking is, after all, very close to the engineering design process. Wrong. We need to shift away from a focus on disciplinary knowledge to understand the kinds of habits of mind which engineers actually have in the real world, in other words to Ruby's 7Cs. This week, with the Royal Academy of Engineering, we launched Learning to be an Engineer: implications for the education system, a collaboration with the University of Manchester and Primary Engineer. The research draws on earlier work by Bill, Guy and their colleague Janet Hanson. 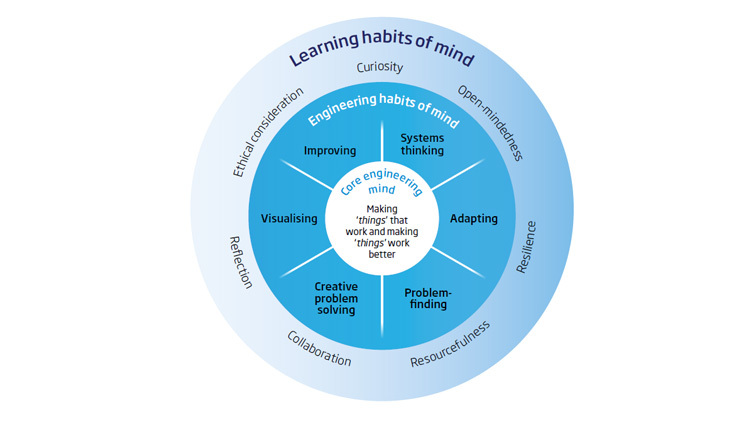 In it we describe the results of a two-year study into how schools which focus on engineering habits of mind as well as on Steam subjects find this a helpful way to promote an active engagement in engineering. We all need to build teacher capability through professional development to embed these habits into everyday teaching. One FE college and 33 schools in Glasgow, Manchester and the south of England took part in the research, with 84 teachers and more than 3,000 pupils. With the teachers we identified a cluster of three powerful signature pedagogies: the engineering design process, playful experimentation or what we term "tinkering" and authentic engagement with engineers. Each of these is important in the cultivation of engineering habits of mind. With a range of professional development suppor,t all teachers managed to change their practice to move away from subject dominance to a focus on broader habits of mind. While we believe that disciplinary knowledge is essential, our research suggests that we need to be less hide-bound by this, explicitly teaching the habits of mind and engineering capabilities that will set children and young people up for the future, making them more creative, resilient and career-ready. These habits of mind are not exclusive to engineering but will enhance development of young people towards any career. Engineering is a varied profession that contributes 20 per cent of the country’s gross value added. But it’s facing a skills crisis that threatens its future sustainability. Engineering habits of mind are vital for the future growth of the UK economy, whether they’re applied to civil engineering, hardware development or medical robotics. For engineering is rooted in curiosity, creative problem-solving, adapting and improving, all of which we see young children demonstrate. Unfortunately, a knowledge-focused curriculum can all too easily leave these habits of mind undeveloped. "If we see engineering education in terms of desirable engineering habits of mind as well as subject knowledge and clearly articulate how best these can be taught; and if we offer teachers high-quality professional learning to design new ways of teaching and working with engineers; then we can understand what schools need to do to ensure more students have a high-quality school taste of what it is to be an engineer so that more choose to study engineering beyond school and potentially become engineers." Even in times of very great change, schools rose magnificently to the challenge of these projects. Just think what might happen in calmer times. This blog first appeared in the TES. You can read the orginal here.